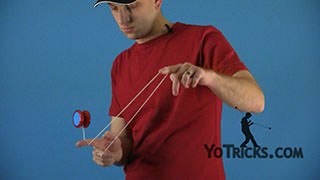 Learn how to do the Man on the Flying Trapeze and His Brother Slack Yoyo Trick. Man on the Flying Trapeze and His Brother Slack Yoyo TrickThis is a slack trick done on the Man on the Flying Trapeze and His Brother Mount, it looks like this. That’s it. This trick is great because it is one of the easier slack tricks to learn and it is a good introduction to those types of tricks. So I will show it to you right now. The first thing you want to do is get on your Man on the Flying Trapeze and His Brother Mount. 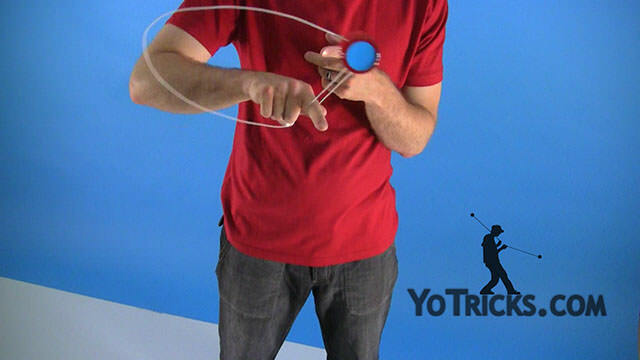 All you are really going to do is pinch the string right here in the first finger of your yoyo hand with your thumb. Then you are just going to take the string. You are just going to let it off this finger and you are going to whip it around to the outside and then catch it when it comes back around. It is really that simple. The key is to make sure that you have a nice steady swoosh with your string, if you want to call it that. So again it just looks like this. You are going to pinch it. Move it around like that. Get your finger back in. If you stay nice and steady then that string is going to stay open really wide so it should be really easy to catch. It is a really great trick for combinations, so you will see a lot of guys put this in right in the middle of their tricks, so you can just do it like that. So that’s Man on the Flying Trapeze and His Brother Slack.